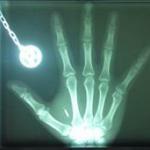 Hi, 2 days ago i had a rfid 125khz implant in my right hand.Most of the swelling is gone, it heals nicely. I have a handheld rfid writer which i used to clone a rfid card to my implant successfully. At the front door i have a yk-568l keypad that reads 125khz tags.Small, big, it reads them easily but not when it comes to my implant. I really have to insist like ALOT to work. The rfid capsule i have in my hand is not too deep in the skin, i can feel it if i gently press on it. Now, what can be the problem? The implant, the yk-568l keypad, maybe the little swelling i still have? Any ideea what more tests i can do in order to understand where the problem is ? Most card readers have a coil that's designed to magnetically couple with the large coils in a 'credit card' sized tag. That is, the coil is a large flat shape, rectangular in the case of a card, some of them are keytags that are circles, but in both cases the coil itself has a large diameter and short 'height' or length. The coil in the glass implant tags is very short diameter but longer in length. It's a different geometry, and it doesn't couple well with readers designed for the larger tags. You can usually find a 'sweet spot' on the reader, but you need to get the position and orientation correct. Generally, you want your implant to be perpendicular across the edge of the coil in the reader. Once you know where the 'sweet spot' is, you can hit that every time and get much more constant reads. I tried like every mm of the reader and changing my hand position.I'll wait a few more days and look for another reader.Guess it won't be easy finding one that will "fit" with my tag.Maybe a smaller device with smaller antenna will do the magic, small as a credit card? orientation is most important for those tiny tags, and virtually impossible to get right for a door reader. A different reader coil design where you can insert your hand into the reading coil offers a lot more freedom. RFID-Based cat-flaps feature this sort of design. Also, door readers aren't exactly build to work with weak signals. replacing the entire front-end circuitry can be an option. There are far more sensitive rfid-reader designs out there. I think it is also the swelling that it is a bit difficult to read it. Oh, forgot to say that it's all good now, this reader works okay with the implant.Here's a vid.